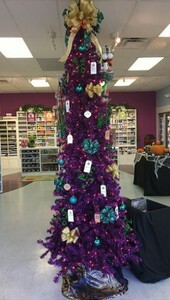 You may have noticed our festive pink tree as you enter the store this month. That's our Giving Tree, ready for you to help celebrate and support the Michigan Greyhound Connection. Stop in anytime through Monday, November 27th to pick up a tag from the tree and select an item to benefit the Michigan Greyhound Connection. We're decking the halls early for the holidays! You may have noticed our festive pink tree as you enter the store this month. That's our Giving Tree, ready for you to help celebrate and support the Michigan Greyhound Connection. We're collecting needed items to help their efforts to care and find homes for these beautiful animals. Suggested items are: food, treats, toys, beds, raised feeders, Martingale collars, leashes and crates. From the volunteers & our lucky rescued greyhound recipients, Thank You Pet Beastro & generous donors! December is a busy time for us & we have many dogs traveling from the tracks this month. What a wonderful Christmas they will have!